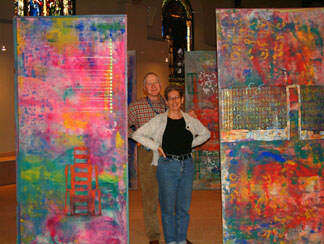 I am a Philadelphia native, and have been producing art here for about 40 years. During that time, I have worked in different media, as well as 2D and 3D work. Starting out in photography at the Philadelphia College of Art in the late sixties, I went on to painting, then mixed media work, sculpture and installation. In the last several years I circuitously got around to painting on canvas again, and then on to the pastels exhibited in May, 2005, at the DaVinci Art Alliance in Philadelphia. Themes running consistently through my work are lively, intense color; expressive line and gesture; interest in ancient civilizations, ruins, the cycles of time; and memories and imaginings of all these. When I switched from painting on canvas to works on paper, I felt liberated, and the themes that interested me in painting emerged in a new and deeper way in the mixed media works. It was very exciting to see this consistency of subject, even as the materials changed dramatically. I have found it helpful to remember that painting is a long distance run, not a sprint. I have been amazed at the things my art has taught me. When younger, I never realized this was the big reason people keep doing art. Pennsylvania Academy of the Fine Arts, Part time studies. For a complete résumé listing shows and other pertinent information please contact Fran Gallun. Fran Gallun is a Philadelphia area artist who has shown extensively in the tri-state area for over twenty years, including at ongoing installation in Philadelphia’s Rosenfeld Gallery. Major shows include The Port of History Museum, The Painted Bride Art Center, The District of Columbia Jewish Community Center, The Gershman “Y” in Philadelphia, University of the Arts “Window on Broad”, The Walt Whitman Cultural Arts Center, and Gettysburg College. She was a 1995 Fellow at The Virginia Center for the Creative Arts, and at Mishkenot Sha’ananim in Jerusalem in 1998. 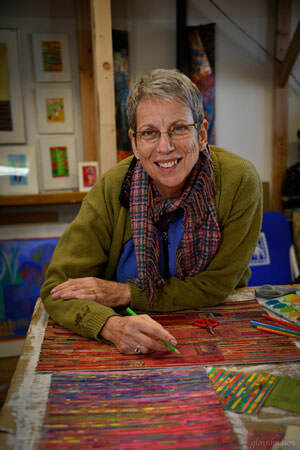 In addition, she was the first recipient of the Dene M. Louchheim Faculty Fellowship from The Fleisher Art Memorial in 1990. Currently an instructor at The Fleisher Art Memorial, and formerly exhibitions coordinator for the Camden County Cultural and Heritage Commission, she has also been an adjunct instructor of art at Rowan University, and was artist-in-residence for Haddonfield Memorial High School in 2004. She also was curator of “Dreamscapes for the New Millennium” at the Walt Whitman Cultural Arts Center, and “Contemporary Women Artists of Philadelphia” at the Wallingford Art Center. In 1997 she was co-designer of “Sanctuary of Remembrances: Personal and Collective Memories of Lives Lost to AIDS”, which was a year-long interactive work-in-progress at the Fleisher Art Memorial. My recent work continues to be about landscape; in particular the basic geometric shapes that comprise our world. I search for what is under the horizontal line: suggestions of possibilities, secrets, and unknown worlds. The landscape image stands for order in the universe, the geometry of the earth we can rely on. The simplicity of horizontal and vertical which we see in trees, structures, dwellings, feels ancient and eternal, reminding me of centuries of civilizations, peoples rising up and passing away, making way for new eras. I find the eternity portrayed by these images reassuring. This work is collage and mixed media. I like color, surprise and playfulness which are supported by the directness of collage. Recently, I began to incorporate printmaking into the mix, and am enjoying this added dimension.